I’ve missed baking with bourbon, and ever since I moved to my new apartment, I knew that this was the time to buy a handle of bourbon to fulfill all my baking desires. While I enjoy a nice top-shelf bourbon for sipping, Jim Beam works just fine when it’s going to be complemented with chocolate and copious amounts of sugar. 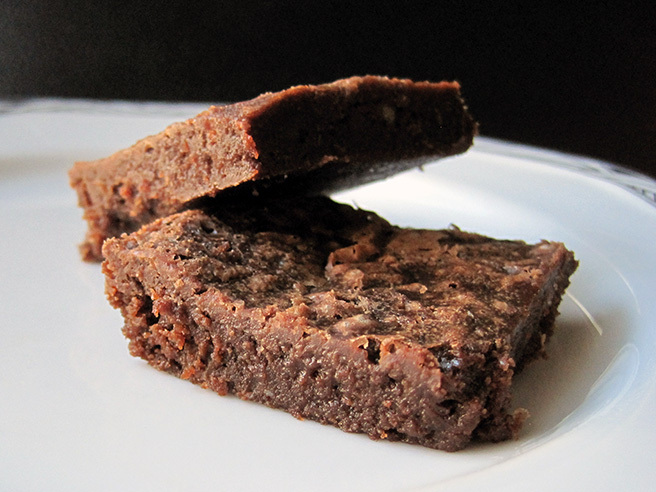 The first recipe to kick off this bourbon baking dry spell was this batch of bourbon brownies. The original recipe recommended a sea salt topping, but I forgot and now this is just a fudgy brownie with notes of woodiness. It’s not going to make you drunk but you can definitely taste the bourbon. I’d recommend eating these brownies chilled; it really enhances the fudginess. Whiskey and chocolate just go so perfectly together… I actually had some chocolate-infused, locally-made moonshine from King’s County Distillery and really enjoyed it. As usual, I sub in gluten-free flour when adverse effects are minimal. I used Carol Fenster’s baking mix of 1 cup rice flour, 1/2-3/4 cup potato starch and ¼ cup tapioca starch/flour. The downside to this flour is that it tends to clump up and might lead to clumps in your batter. Preheat oven to 350F. Line an 8×8-inch baking pan with aluminum foil and lightly grease. In a small microwave-safe bowl, melt together butter and dark chocolate in the microwave. This should be done in 30-second intervals to avoid overcooking the mixture, stirring to ensure that the chocolate has melted. Allow mixture to cool slightly and transfer into a large mixing bowl. Whisk sugar and cocoa power into butter mixture. Whisk in eggs, one at a time, followed by 1/4 tsp salt, bourbon and vanilla extract. Whisk in the flour and stir until it is just incorporated, and no streaks of dry ingredients remain visible. 1. It’s no-bake and thus super quick to assemble. 2. You can even use all store-bought, ready-made ingredients to assemble your trifle. 3. If your layer cake fails, turn it into a trifled “deconstructed” dessert. 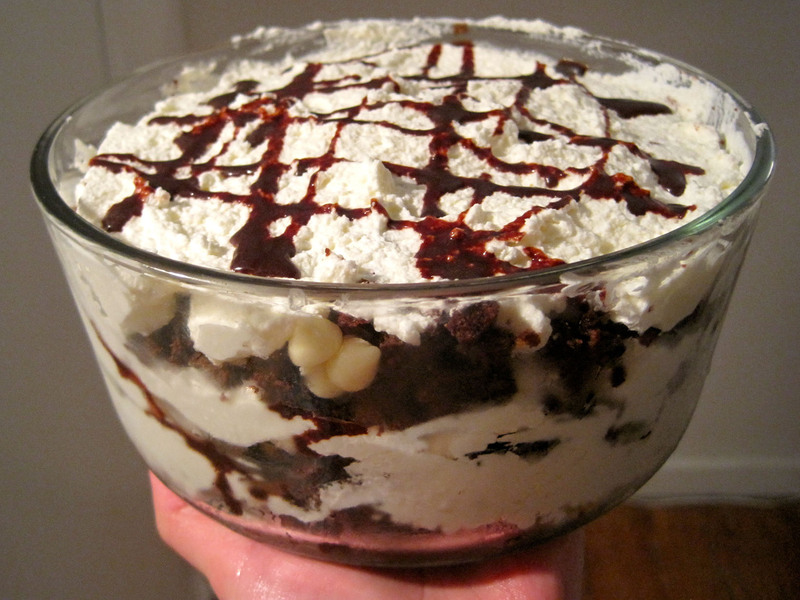 This chocolate cake trifle was borne out of the third reason. I had made a chocolate whiskey cake, only I tweaked the recipe to double the amount of whiskey to 1 cup, and omitted the coffee chocolate chips. If I found the original recipe a tad too sweet, this new incarnation was excessively alcoholic. I legitimately felt tipsy after a slice, and would mostly eat it with a scoop of ice cream to offset the dryness and high alcoholic content. The poor cake languished in my freezer for a while, until I chanced upon this chocolate sauce recipe. I loved that it didn’t contain any ingredient that couldn’t exist outside the refrigerator, which would imply that it’d have an extended shelf life much like a commercial chocolate sauce. I made a batch of it, and I saw it as the perfect solution to my dry and un-sweet chocolate cake. Then I had another great idea. I had some heavy cream left over from the Sachertorte. What if added a bunch of whipped cream to it and made it a trifle? I made short work of it, both in making and eating it. I added some white chocolate chips for textural contrast and added sweetness. It ended up being a high whipped cream to cake ratio, which meant that the flavors ended up balancing out perfectly. This is not so much a recipe as guidelines for freewheeling creativity. Go wild! 1. Start whipping heavy cream on high with a mixer (or laboriously by hand if you don’t have a mixer – it is possible, just tiring) and add granulated sugar to taste. 2. 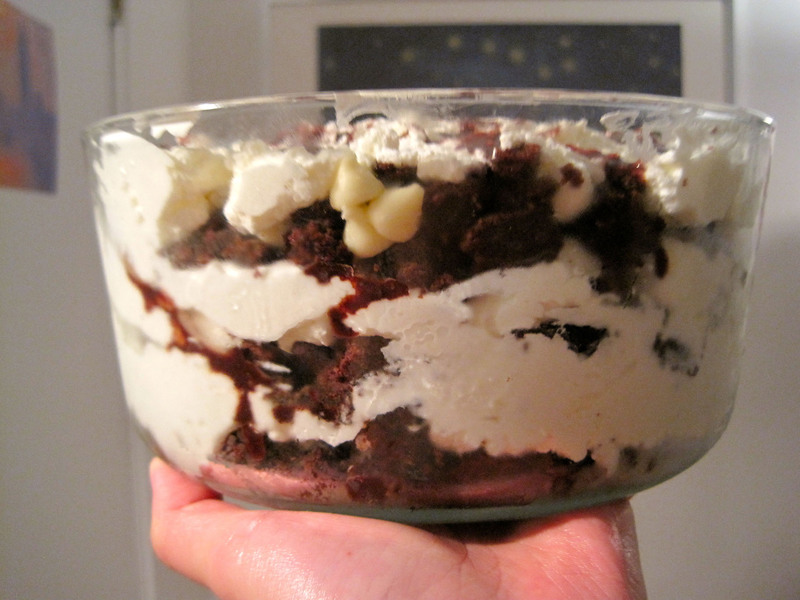 Crumble chocolate cake into a container – ideally glass, so everyone can see the strata that make up your trifle. Spoon some whipped cream into it and even out. Squirt a bunch of chocolate sauce on to it. Sprinkle a handful of chocolate chips. 3. Repeat until a limiting factor presents itself – for me, the whipped cream ran out first. 4. Let sit for an hour so the cake moistens from the sauces and whipped cream. If you’re not patient enough, go ahead and eat it right there and then anyway. When I saw this recipe, I instantly knew I had to make it. I know I’ve been diverting my attention lately to more European desserts, but you could never tear me away from anything combining chocolate and whiskey. I was deciding between using Jim Beam and some cheapo scotch lying around, and went for the scotch because I was counting on all that sugar and chocolate to cover it up. Cooking is the best way to use up bad alcohol anyway. What was interesting about this recipe was the preparation technique. I had to heat up a saucepan with coffee, butter, whiskey and cocoa powder, and then the addition of sugar turned it into a gloopy, caramelly liquid. Fortunately the cake turned out well, though. I really liked the slightly crisp muffin top-esque shell that formed, which was a nice foil against the tender and moist crumb. The chocolate chips added some gooey-ness to its insides so it was reminiscent of a molten chocolate cake. It didn’t taste very alcoholic at all, and I wish it had. This is a very decadent cake, and in a future iteration I might add a pinch of salt, or sub some of the coffee with whiskey, or omit the chocolate chips. Note: Although the recipe called for making a whole cake, I think the cake would benefit greatly from being split up into about 8 or so 3.5-inch ramekins, or even cupcakes. Reduce the bake time accordingly. You’d also get that delicious crusty muffin top. 1.Heat oven to 325 degrees. Butter a 10-inch springform pan. Dust with 2 tablespoons cocoa powder. 2. In a medium saucepan over low heat, warm coffee, whiskey, 12 tablespoons butter and remaining cocoa powder, whisking occasionally, until butter is melted. Whisk in sugars until dissolved. Remove from heat and cool completely. I’m a big whiskey person (as evident from my boozy desserts) and when I saw this banana-infused whiskey in the weekend section of the WSJ, I knew I had to replicate it for myself. The recipe only involved two ingredients and four days. Of course I had to do this for myself! And boy, was it oh so delicious! I was slightly hesitant about buying a bottle of Jameson because it’s slightly pricier than my beloved Jim Beam (which I’ve found to be a perfect balance between cheap whiskey and good whiskey) but I’m so glad I did anyway. The bananas take the bite out of whiskey, and what you’re left with is a smooth, almost honeyed liquid that smells like bananas and tastes a little sweet going down your throat. It’s perfect just by itself on the rocks. Which reminds me, I really should invest in some rocks glasses if I’m about to be drinking more whiskey… drinking alcohol in a mug really isn’t very cool. This is probably the rocks glass I’d want if I were going about getting rocks glasses. This is a Matterhorn glass from Tale. Isn’t it exceedingly exquisite? It makes me want to see the Matterhorn, now. 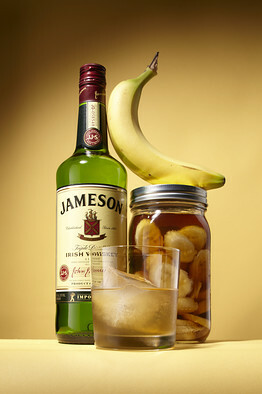 Place bananas and Jameson into a sealed container for three to four days. (It doesn’t have to be refrigerated!) Strain out banana slices using a mesh strainer and discard. The infusion should be slightly viscous and cloudy—this gives the drink its unique texture, body and flavor. Pour infused Jameson back into container or bottle. Serve in a rocks glass with a single cube.